At NuFlow St. Louis, we offer a variety of highly effective sewer repair solutions to handle any plumbing maintenance need. Our methods are specially designed to take advantage of existing access points so there’s no need for major excavation. Whether you’re worried about your aging sewer lines, struggling with a blocked pipe, or even dealing with a broken main, we have advanced technology to restore your pipes quickly and affordably without extensive damage to your home or lawn. When Are Sewer Line Repair Solutions Recommended In St. Louis, Missouri? Our sewer camera inspection service provides NuFlow St. Louis the knowledge needed to help homeowners and businesses take a proactive approach to sewer maintenance. This remote inspection system can collect video of pipes anywhere, even those buried in the lawn so that the health of the sewer lines can be evaluated and managed. 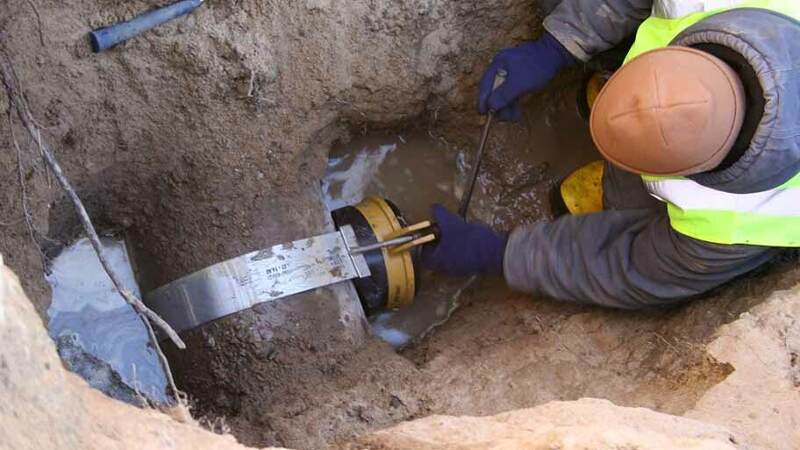 Our cameras also help guide our advanced trenchless repair tools during repairs, allowing us to effectively restore pipes that are inaccessible without excavation. For a clogged pipe, NuFlow St. Louis may recommend drain cabling, also known as sewer snaking. This simple-but-effective tool slides easily into most pipes to break up blockages with a mechanical cutting tip. We then extract the messy material so that it can be disposed of. Drain cabling is an affordable solution for many household drain blockages. If there are more persistent and dense obstructions in the pipes that inhibit our ability to effectively repair the pipes, our skilled technician may suggest hydro jetting service. This powerful tool uses a specialized, high-pressure water nozzle to pulverize tough clogs while also scrubbing layers of heavy buildup from the walls of the pipe. Hydro jetting will completely clean the interior of the pipe, restoring it to its original diameter and remove early corrosion and oxidation, which stops its spread and preserves the pipe surface for longer. Pinhole leaks and leaking potable water lines can be repaired with the NuFlow epoxy coating system. This fast, affordable solution involves the application of liquid epoxy with compressed air. The pipe is thoroughly inspected and cleaned, then blow-dried with hot air and scuffed to help the epoxy adhere. The epoxy is injected into the pipe, where it forms an ultra-smooth coating that only reduces the pipe diameter by a negligible measure. Over the next few hours, the epoxy cures, sealing the pipe to eliminate leaks and restore water pressure. NuFlow St. Louis also offers patented pull-in-place pipe lining, a state-of-the-art method that completely rebuilds the sewer line from the inside with a new pipe made of epoxy resin. This remarkable solution not only seals leaks and cracks but also restores sections of pipe that have deteriorated. The lining is applied by coating a specialized sleeve with the resin and pulling it through the pipe to cover the damaged areas. The sleeve is inflated to form the new, cured-in-place pipe, or CIPP, that not only repairs the old pipe but improves on it. The new pipe is corrosion and damage resistant and lasts for decades. For effective, affordable repair solutions that provide lasting results, you can trust NuFlow St. Louis. We have the latest technology to correct any sewer problem, no matter how difficult. Call us today to discuss your unique situation and learn more about our innovative sewer repair options.